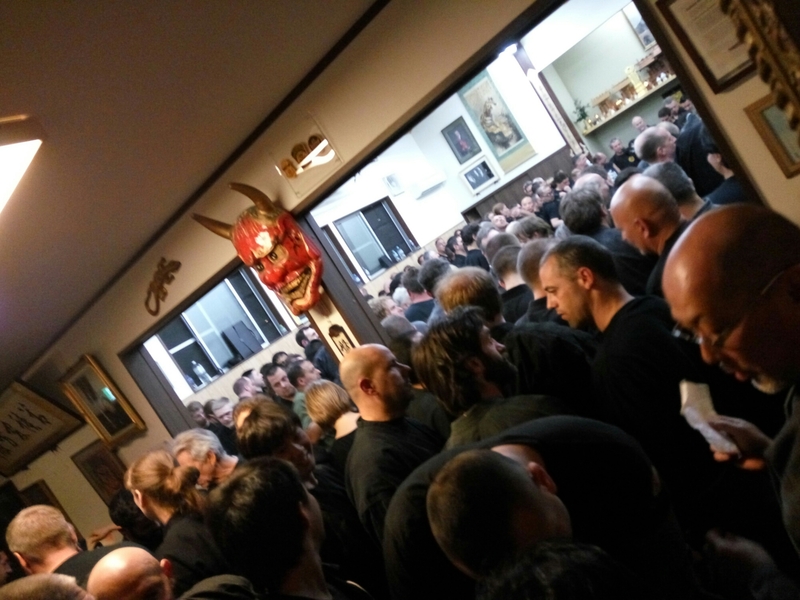 Yesterday 297 participants tried to fit into the Honbu for Sensei’s class. We broke the Guinness book record by nearly 150! To say that training was quite impossible would be lying as Sensei took this opportunity to teach Ninjutsu in crowded areas. This didn’t prevent him to do some knife and sword techniques. Sensei was I great mood and moved like a magician. I had the privilege to open the class, paying attention to do a technique that was fitting the lack of space. Sensei is a “magician” and we had a lot of fun, and we actually trained quite well. Magic is is the name given to science and knowledge, when we are unable to comprehend what we are witnessing. Yesterday was magic! Sensei spoke about becoming zero. Due to the lack of space, he taught how to fight in crowded areas. He was really impressive. And his many Uke were all in pain event though there was hardly any movement to see. He reminded us that this year was about ” Me, Yubi, and Kokyû”, eyes, fingers, and rib cage. To be able to defeat the attacker, he said the key was to lift the shoulder to distract Uke’s attention, and to use the elbows as pivoting points. When I was his Uke, I didn’t see anything. His reactions even though they were soft, we’re impossible to counter as he was always distracting me from knowing from which direction his next move would come. The slight movement of his shoulder was forcing me to focus on his upper body, while the attack was coming from a different angle. Sensei explained that when our movements are prevented because of too many people, or because of a confined space, then this wave-like motion of shoulders, upper torso, and pivoting from the elbows was the answer. The elbows were the meeting point from which the hands would grab, hit or twist. Like a magician performing close-up magic, it was impossible to see what was coming next. He said that because we have no intention, it is impossible for Uke to see the attack. One thing that struck me yesterday is that by telling us “use your shoulder and use your elbows” he is in fact programming us to be distracted from his real movement. And when we try to replicate it, we cannot. We cannot, simply because we try to do it. Trying we are not zero, therefore it is impossible. Speak to uke in order to defeat him. That was brilliant! This attitude of not doing anything is the essence of being zero and if you think of being zero, you cannot be. As he said last week, don’t misunderstand this “zero” concept. Being zero is not being empty, on the contrary. The only thing is not to have any preconceived idea. Uke attacks and you move naturally. What he did with Pedro was amazing. Sensei was there but he wasn’t. Magic! One thing he said, was that you don’t fight the opponent, you refuse the fight and defeat him. Therefore the only one fighting is the attacker. Not having any opposition in front of him, the attacker is not able to react. And when he does, it is too late. This year is about 42, the beginning of the new cycle in the Bujinkan, and I guess that in a few hours we will know more about it. But it is interesting to see that the 297 participants add up to 9 (2+9+7 = 18 = 9). This “9” of yesterday finishes the cycle, and prepares for the new beginning that is supposed to be announced today during the Takamatsu Memorial. Indeed, yesterday was magic and sensei a real magician of Budō. I’m now on my way to it, stay tune for more. did something happened to you or in the bujinkan that hindered you from posting? I really enjoy reading your blog and learning from your insights, and while i came to read about the ceremony, i didn’t find any regard to it. Is everything okie in japan? and more importantly, with you?